In a BBQ competition, cutting and trimming your brisket is as important as and sometimes trickier than cooking it properly. Pitmaster Malcom Reed from Killer Hogs BBQ explains how he trims his competition beef brisket. 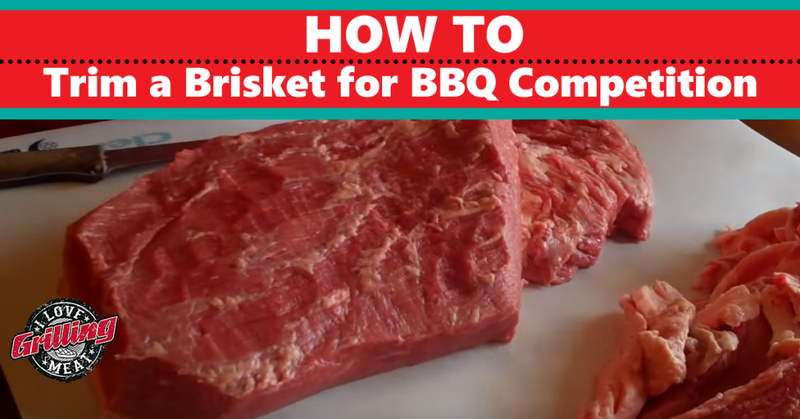 This is how to trim a brisket for competition barbecue to get your brisket slices and burnt ends perfect for your competition BBQ blind box. First of all, you will notice that this method of trimming the brisket is quite aggressive. That’s because it is a method specifically oriented towards BBQ competitions, where perfection is key. If you are cooking for family and friends you can still follow this guide while adjusting it slightly and still end up with an amazing brisket. Pay attention to the thickness of the meat. You are looking for a brisket with a uniform thickness. This will give you nice, thick cuts across the meat. Try to find a brisket with the grain oriented vertically towards the flat. You will avoid having to shape the cut off later. Hold the brisket in one hand, and check how stiff it is. You want it to have a medium stiffness, as this indicates it has wet aged for a while. Obviously you do not want it to be very weak either. Now that you have your brisket, start by washing it down to remove the excess fluids. Next you want to chop off the front which will tell you where to start slicing. Keep the size of your box in mind as you square off the brisket, while also removing any gray (aged) meat in the process. Cut off any big chunks of fat, and get the flat to where you want it for your burnt ends as well. As far as the point goes, also trim off the fat, You do not have to worry about the under side as much because it will act as an insulator. If you see any thick fat you should trim it though. Be careful not to cut too deep in the meat. Try to keep the knife parallel to the meat while cutting. After you have removed most of the fat on the meat, you should remove the silver-skin. It is a tedious task, but makes a big difference and should not be too difficult with a sharp knife. You now know how to trim a brisket, and the meat is ready to go in the smoker! Good luck at the competition, and enjoy. 5 Best Practices For Preparing Your Meat We all know that there’s some awesome information within the ILGM VIP private group on how to grill and smoke anything from a full pig to a peach seed and make them taste wonderful, so I was thrilled when I was asked to give my input via this “How To” article.